Finally got the flickr embed sorted. Here is the 1st work I have done on the model over last week. This is from the Iveco kit. This is the work done on the Daf chasis, it will be cut down and added to the Iveco chasis. Looking nice, Richard. What color are you going to paint the transmission? I still have to do some research on trani colours. It'll be interesting to watch those two kits become one. More work done on mine. Plumbing is in now. Dash is in. Wheels/hubs and tires ready. Fuel tanks on. Battery boxes tomorrow? I bought some 1/48 scale aircraft gauge decals some time back. Six of them now in the dash of the Mack. I have a set of decals on the way that should fill up the two main gauges. Touch up paint needed in a couple of places. Peter, that looks interesting. I have no idea what that is. Richard, I believe that most transmissions (new) were either semi-gloss black or the frame color. Spicers were Oxide Red, and I think Allison automatics were natural aluminum. Pretty much left to priming the remaining parts as I'm out of Medium Gray. Awaiting an order to come in. 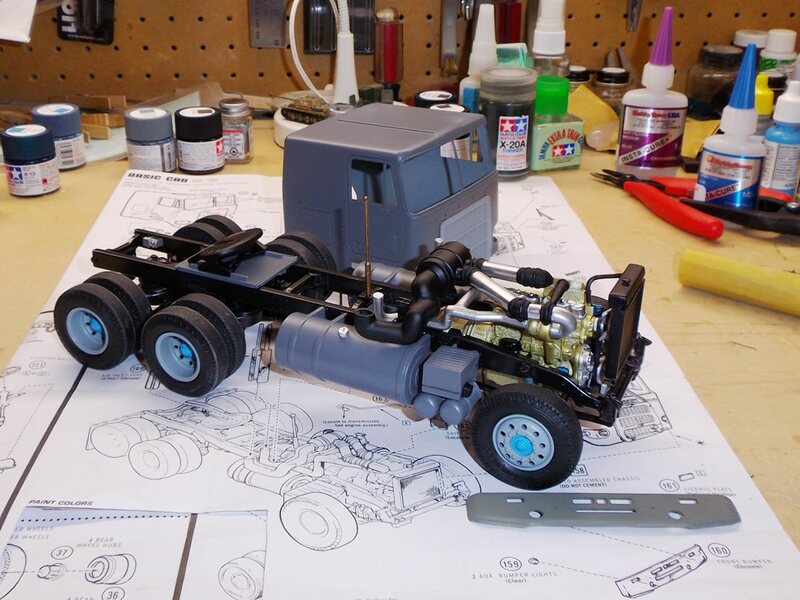 I think the only chrome that'll be on this build is the MACK emblem on the front and perhaps the roof lights and horns. I have a Molotow Chrome Pen and will see how that works out. Cab is Ghost Gray and most everything else that attaches to the cab will be the Medium Gray (like the grill). Now debating about a stripe (or two) on the cab. Dunno. The rig I am building is a deicing rig I drive at EDI airport. Some major work done on the main chasis today with air tanks and fuel tank on. Wheels painted and tyres done (pics to follow). I hope to get started soon, I finally have my workbench sorted. Rob, that's one clean workbench! What's that Wingy Thing by the computer? Peter, nice work on the IVECO, or is it going to be a DAF? That was an F-111 before my landlords got a hold of it. 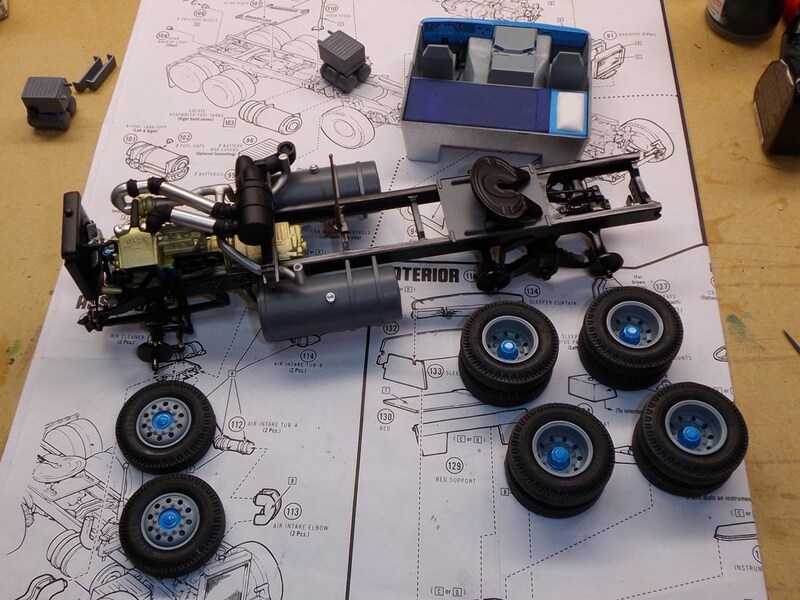 It will be an Iveco, I will be using just the front wheels for the rear wheel steering from the DAF and also the box section and the rear bit of the chasis. Here is some more work done today. Back to work tomorrow so nothing for 4 days. Liking the builds on here. Looking forward to everyones completed items. Pete, the cab looks neat! I like it! I have done a fair bit to the deicing rig over the last 3 days, and will have a good half day on it tomorrow. 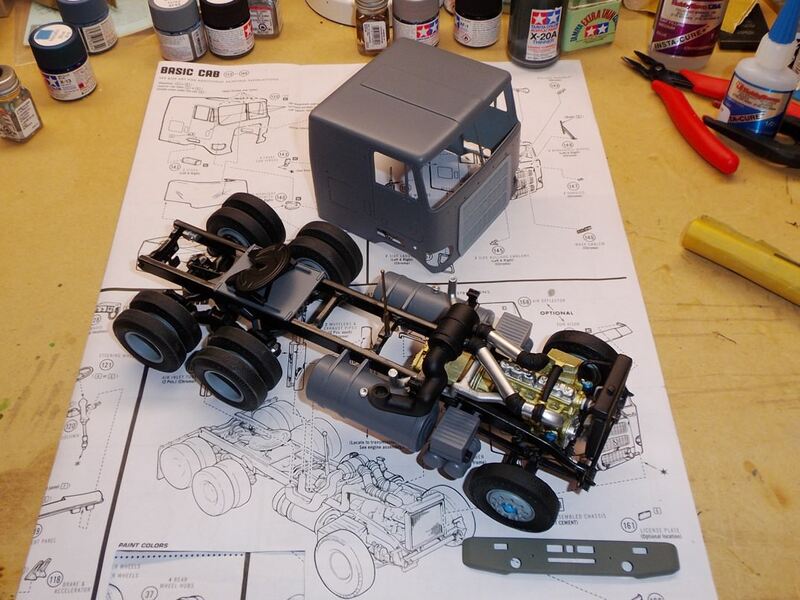 Rear axle and wheels painted and ready to be attached. The main chasis and I have added a small panel to raise the back tank and equipment bay area. Tested for fit. Note the holes in the side, this is for the side doors for access to the equipment bay and turntable. I am not sure whether to have one of the side doors open, as there is alot of workings in there. That will be me for 4 days as back to work tomorrow. Really nice work Peter. The shell is looking good and that mash up of the running gear...unique. Peter, you're doing great there! I cannot wait to clear my bench and start mine! 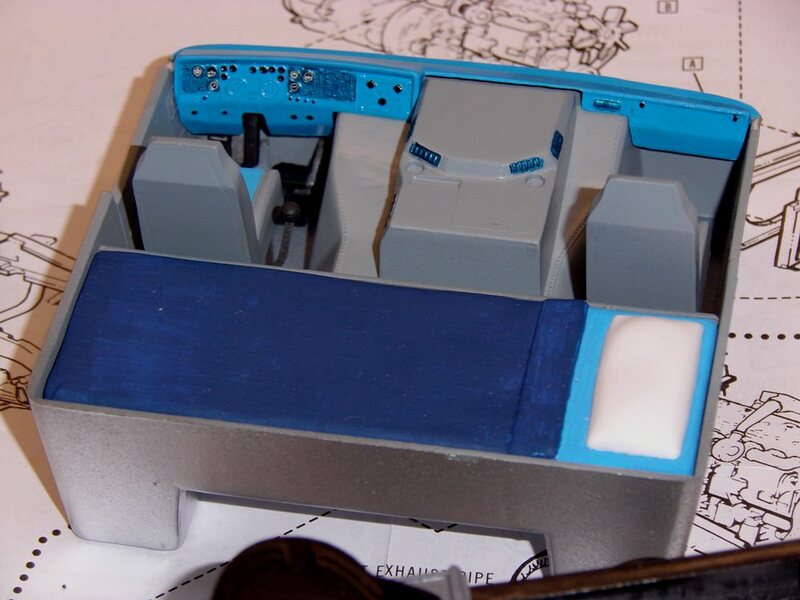 I will be modifying the trailer and doing some scratch building as well. How long it will take or how far I will come to finishing it? Well, we shall see. Charles a nice looking Scania. We have 2 at work they are great vehicles. Here is the work I have done today. Cab is complete, just the back and the boom to sort then work on the basket. Peter, the way you took the picture makes it look real. Great! Any thoughts on painting the IVECO sign? 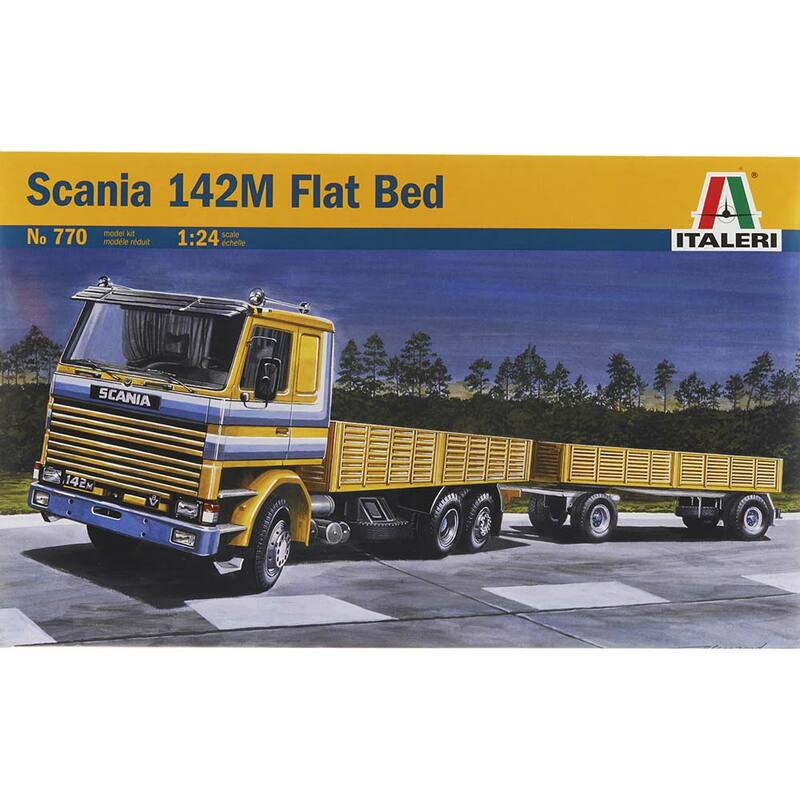 I will use the decals in the kit for the Iveco sign. There will be lots left over in this and the DAF kit, but I am sure I can put them to good use. I am thinking of building a Scania to at some point along the same lines, but the Iveco is my favourite rig at work. Automatic and nice to drive. The back is only dry fitted as I have more work to do on it. It needs another gloss coat now the decals are on. I will start work on the basket next. Great work Peter, it's really looking good!